Come and join us for our Top Gear Mystery Car Night on Wednesday 3rd April at 20:00 BST. We will start out in free roam where we will have to follow the clues to find the Mystery Car. Once the car is revealed we will all buy it, modify it then spend the night racing it. Come and join Aslad & The Vans Society in Survive the Hunt, where the aim is to… well, survive the hunt! Saturday 6th April 19:00 UK time. What is Survive The Hunt? 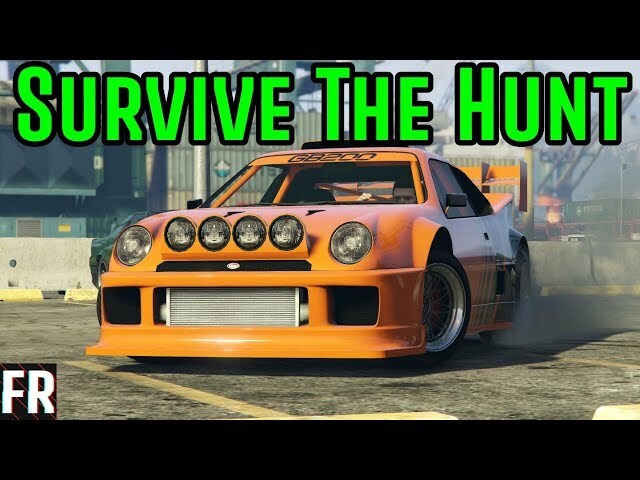 Essentially, Survive The Hunt is a freeroam game mode where one player is “hunted” by 8+ other players. There is no radar, HUD or name-tags in order to make this a bit more interesting. While there is no set tactic, the most popular and effective one is for the hunted player to “blend in” with the game AI – either on foot or in a car. This means obeying traffic laws, following the road at an AI-ish pace, stopping at traffic lights etc. The hunters can employ a similar tactic to attempt to locate and then ambush the hunted player. Communication is essential for the hunters to work effectively together. If you want to see this game mode in action, check out FailRace’s YouTube series. Radar, player names & the HUD must be turned off. All players must stay within the city limits at all times. This area defined below on the map. The inside of the airport fence perimeter and the docks/terminal area are also off-limits. The hunted person has a two minute head-start on the hunters. Weapons may NOT be used whilst in a vehicle. They can only be used on foot. The idea behind this is that it makes chases a bit more interesting than just head-shotting someone the second they’re spotted. Any type of explosive weapon is banned. One helicopter is allowed to be used by the hunters. It cannot use any weapons and must not have missiles (to stop cheating using missile lock). Any type of weaponised or special vehicle is banned. The hunted player may not camp or hide inside buildings, underground areas or in car parks. They are allowed to briefly stop, but for no longer than a couple of minutes. This does not mean that they are not allowed to drive through road tunnels – they can, as long as they do not stay there for extended periods of time. The hunted player should not be in a party or voice chat with the hunters. This weeks Van Society Midweek Motorsport event will a Top Gear ‘Reasonably Priced Car’ night featuring the Maibatsu Penumbra. After a brief meet up in free roam we will launch a playlist of races using the Penumbra. We will be racing ‘contact’ on the night so please be aware of our racing rules. We will also start with a run on the Top gear Test Track so please familiarise yourself with this track so you are not at a disadvantage on the night. Your car can be fully modded on the night, best looking car will be awarded a racing advantage too. Come and join us for the Xero Gas Race Night. We will be racing a selection of Xero Gas themed user created jobs in a variety of classes. There will be a few banned cars for each class used to balance the filed and encourage a mixture of cars in each race. We will also be using the a Group system when racing to keep things competitive. The meet up spot on the night will be the Xero Gas warehouse near LSIA, bring along any car with a Xero Gas livery. The following cars will be banned from the classes we will be using on the night. Make yourself familiar with this list to help keep things organised on the night.